Charlie Sheen's ex wife Brooke Mueller went to rehab twice while she was pregnant in an effort to get off drugs. 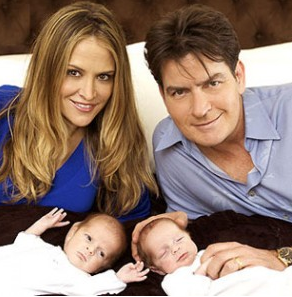 CHARLIE SHEEN’s ex wife BROOKE MUELLER, was using drugs when pregnant with their twins. Two of Brooke Mueller‘s multiple rehab stints occurred while she was pregnant with twins Bob and Max and married to Charlie Sheen, RadarOnline. reported. The startling information that Mueller used drugs while pregnant comes in the wake of her temporarily losing custody of the twins to Charlie’s ex-wife, Denise Richards. What’s more, Radar has learned from several sources that Brooke has been to rehab 20 times over the years. During Mueller’s pregnancy with Sheen’s twins, “she went to rehab twice because she was using drugs,” a source said. “Brooke’s two rehab stints consisted of less than 30 days. Mueller recently checked into the Betty Ford Clinic for a 30-day treatment stint, marking the 20th time she’s entered a treatment facility to seek help for substance abuse. Coke heads having babies with meth heads. People don't care about themselves so why would I expect them to care for their children. And if an ex wife got custody of children they are not related to, you're doing bad.